Dice up the pepper and courgette. Gently heat the Donegal Rapeseed Oil infused with Garlic on a medium to high heat in a large frying pan/skillet. Add the courgette and pepper and sauté for about 5 minutes. Add all the dry spices and continue to cook for a further two minutes, stirring constantly. Add in the tin of chopped tomatoes, the tomato purée, the sugar and the water. Lower the temperature to a simmering heat and allow the mixture to reduce and thicken for about ten minutes. Taste and season at this point too with some of the fresh coriander, salt and pepper. One by one, make little wells in the mixture with a spoon and crack an egg into each one. Leave the mixture for about 10-15 minutes depending on how you like your eggs. 10 minutes will give you nice runny yolks. Sprinkle the rest of the fresh coriander over the Shakshuka and serve with some ciabatta or sourdough bread to mop up the tasty sauce. Shakshuka – meaning mixture, is a popular Middle Eastern dish consisting of eggs poached in a delicious tomato based sauce. 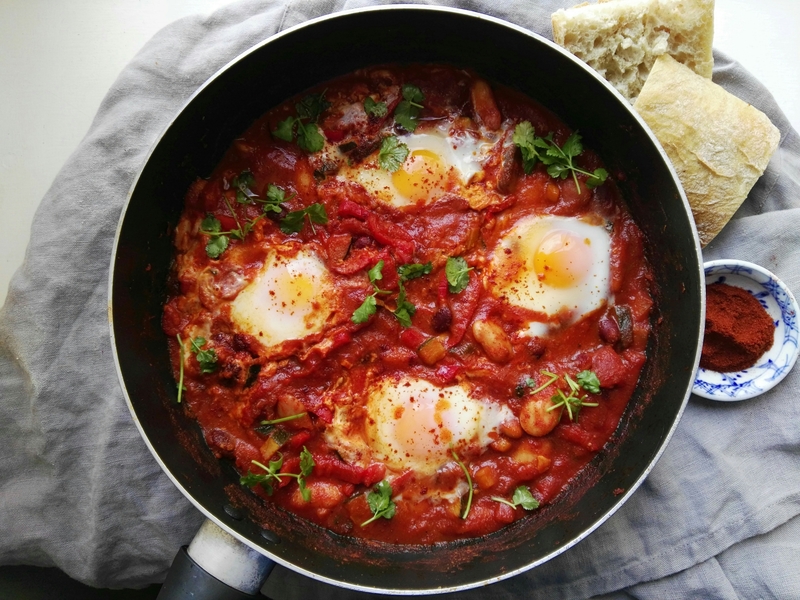 A dish that is mainly seen on a brunch menu in Ireland, Shakshuka can be eaten for breakfast, lunch or dinner and is a fantastic one pan wonder – perfect for sharing.